We hadn’t expected to receive 68 entries for this topic, in a city where half the people don’t know what a mayor can do. 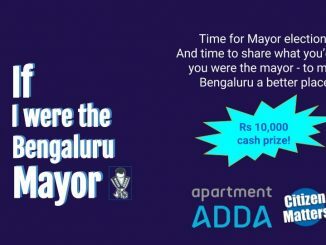 Our contest, ‘If I were the Bengaluru Mayor’ became an all-time hit, with submissions overflowing with ideas! There were 54 English entries, and 14 Kannada entries. We read them again and again, and shortlisted 10 English entries and 5 Kannada entries for the judges to decide. The judges included Manjula Sridhar, an entrepreneur, Harish Narsappa from Daksh, Yatish Kumar from Prajavani, Rasheed Kappan from Deccan Herald and Prakash Belawadi of Suchitra Film Society. The winners were: Srinivas Alavilli, a software engineer with Oracle, for his entry in English category, titled ‘Plan Bengaluru 777‘ and Veda Athavale, head of the Sanskrit Department in Delhi Public School, for her entry, titled ‘ಬೆಂಗಳೂರಿನ ಮಾಲುಗಳಲ್ಲಿ ಗ್ರಂಥಾಲಯ, ಕಾಲೇಜುಗಳಲ್ಲಿ ಮೇಯರ್ ಮತ್ತಿತರ ಕನಸುಗಳು. 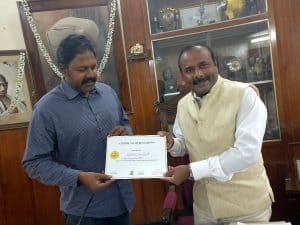 We had been trying to get an appointment with the Bengaluru Mayor Sampath Raj for over a month now, and we finally got to meet him and the Deputy Mayor Padmavathi, last Saturday, December 2, 2017. At 10 am, the Mayor walked in and greeted us at his office. After talking to a few others waiting for him, he turned his attention to us, ready with a paper and pen, eager to listen to the ideas from the winners of the contests. 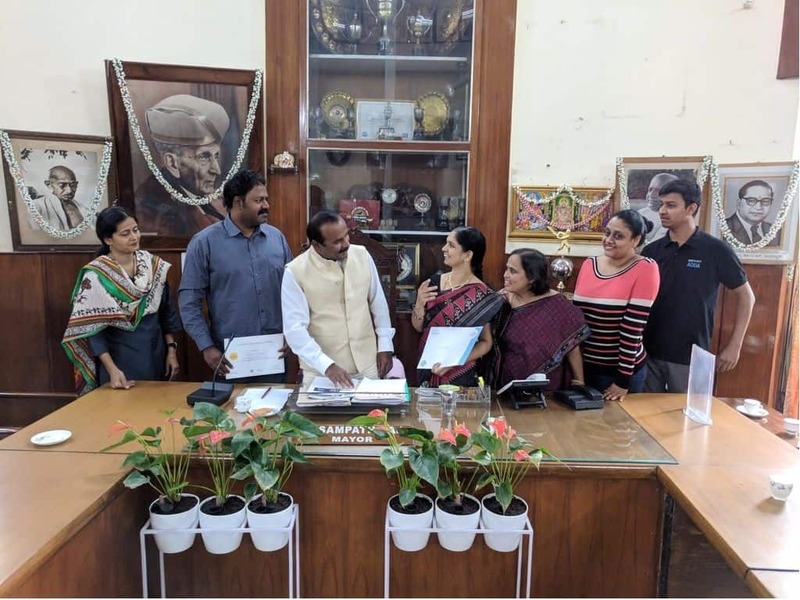 Yesterday I was given an opportunity to share my essay with the Mayor of Bengaluru since this time around the topic is “If I were the Bengaluru Mayor..” – my submission was adjudged winner in English category. Veda Athavale’s submission won in Kannada category in the online essay writing contest held by Citizen Matters and Apartment ADDA. I urge you to read my essay 🙂 and share your valuable opinion. The contest rules said it must be practical and I took that seriously and curbed my enthusiasm to a great extent. I will be thrilled to discuss the ideas and how we can perhaps bring them to life. The winners presented the booklet of selected shortlisted entries to the Mayor. The Mayor issued certificates for the winner, and cheques sponsored by Apartment Adda, our partner in hosting this contest. The Mayor has promised that he would go through the entries and make note of valuable suggestions. Now, we are thinking, what should be our next writing contest! 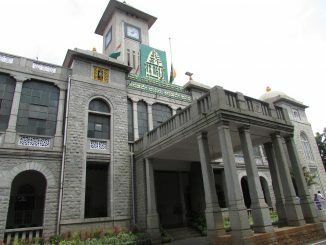 ಬೆಂಗಳೂರು ಅಂದ್ರೆ ಅವಕಾಶಗಳ ನಗರ. ಜೀವನ ಕಟ್ಟಿಕೊಂಡು ನೆಮ್ಮದಿಯಾಗಿ ಬಾಳಬೇಕು ಅನ್ನುವ ಸ್ವಾಭಿಮಾನಿಗಳಿಗೆ ಹೇಳಿ ಮಾಡಿಸಿದ ಜಾಗವಿದು. ಆದ್ರೆ ಈ ಸ್ವಾಭಿಮಾನಿಗಳು ಸೃಷ್ಟಿಸುವ ಕಸ ನಮ್ಮ ನಗರದ ಕತ್ತು ಹಿಸುಕ್ತಾ ಇದೆ. Plan Bengaluru 777: A vision for City Mayor to work on! Strategy should be to elevate the stature of the Mayor’s office, take up small but significant set of things that lead to perceptible improvements, and to get citizens involved in local decision making. Thanks Citizen matters …. 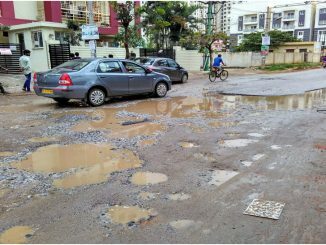 It was an unique opportunity to share our thoughts with Mayor..
For your next subject for open discussion – How to keep Bengaluru roads pothole free!